If we see the people across different regions of the world, we find that they look quite different from each other but their basic needs are the same i.e. food, clothing and shelter. The difference in looks is to some extent due to the climatic factors and environmental conditions. The differences in looks may be difference in skin colour, hair colour and type; facial features, height, weight, etc. The tropics have been historically defined as lying between the Tropic of Cancer and Tropic of Capricorn, located at 23.45° north and south latitude respectively. The literal meaning of the word ‘sub’ is ‘under’. The subtropics are geographic and climate zones located roughly between the 23.5° and 38° parallels in both hemispheres. 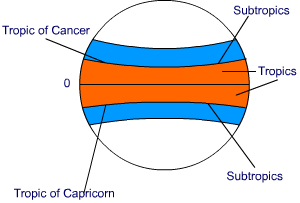 Thus, the subtropical regions lie beyond the Tropic of Cancer and Tropic of Capricorn in both hemispheres. The Amazon Basin stretches directly on the equator and is characterized by hot and wet climate throughout the year. It rains almost every day here. The temperature during the day is very high; the humidity is also high during the day. The temperature at night decreases, but there is high humidity. Hence, both the day and night are almost equally hot and humid. Since it rains heavily in this region, the forests are very thick. The forests are so dense that sunlight does not reach the land. Hence the land is damp and dark. Consequently, only shade tolerant vegetation can grow here. Orchids and bromeliads grow here. Birds: Toucans, humming birds, birds of paradise are found here. The brilliantly coloured plumage and oversized bills for eating; make these birds very different from the birds commonly seen in India. These birds also make loud sounds. Animals: Monkeys, sloths, and ant eating tapirs are found here. Various species of reptiles and snakes are also found here. Crocodiles, snakes and pythons are in plenty. Some of the species of snakes are anaconda and boa constrictor. Many insects and species of fishes (including the flesh eating Piranha fish) are found here. People grow most of their food in small areas after clearing the trees in the forest. Men hunt and fish; and women take care of the crops. Since hunting and fishing are uncertain, farming is necessary to ensure availability of food. Tapioca, pineapple and sweet potato are the main crops. Manioc or cassava is the staple food. It grows underground; like potato. Queen ants and egg sacs are also eaten by the people of Amazon rainforests. Cash crops like coffee, maize and cocoa are also grown. They practice ‘slash and burn agriculture’. The rainforests provide a lot of wood for the houses. People live in thatched houses shaped like beehives. Apartment – like houses called ‘Maloca’ with a steeply slanting roof are also found. With passage of time, the life of the people of this area is slowly changing. Previously, navigating through the river was the only means of reaching the heart of the forest. The Trans Amazon highway was made in 1970. It made all parts of the rainforest accessible. Aircrafts and helicopters are used to reach all previously inaccessible places. These changes forced the indigenous people to relocate. But they still continue with their distinctive way of farming. A gradual destruction of the biologically diverse rainforests is happening because of the developmental activities. A large area of the rainforest has been disappearing in the Amazon basin, thereby leading to a serious implication which is: washing away of the top layer of the soil and making the land barren. It is a way of cultivating land in which farmers cultivate a piece of land by slashing/cutting the trees and bushes. These are then burnt, which releases the nutrients in the soil. New crops are grown in this cleared field for a few years. Since the fertility of the land is lost after a few years of cultivation, the used land is abandoned and a new set of land is cleared for cultivation. In the mean time young trees grow in the old field. In this way soil fertility is restored. People can then return to the old land and start cultivating it again.